Fibroadenomas are the most common solid, benign (non-cancerous) masses that appear in the breast. A fibroadenoma is an abnormality of normal breast tissue that forms when there is an overgrowth of breast tissue or an overgrowth of cells lining the milk ducts. 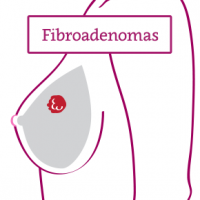 Approximately 9% of the female population have fibroadenomas. They usually occur in women between the ages of 21 and 25. Less than 5% of fibroadenomas occur in women over 50. Fibroadenomas are very receptive to hormonal changes and can change during the menstrual cycle or pregnancy. Their cause is unknown. 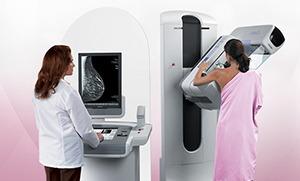 Fibroadenomas may occur as lumps that can be detected during a breast examination or with a mammogram or breast ultrasound. They can vary in size and can become tender, especially premenstrually. Fibroadenomas can be oval, round, smooth, and firm, and they can be moved easily. Fibroadenomas are confirmed through minimally invasive procedures like core biopsy or fine-needle aspiration, which allows the doctor to pull a tissue sample to be sent to pathology. Pathology will look at the tissue under a microscope to determine if it is a fibroadenoma. Fibroadenomas are not cancerous, so if the patient is diagnosed with a fibroadenoma, it does not significantly increase the risk of breast cancer. Fibroadenomas that are not removed need to be re-evaluated with either multiple physical exams or regular ultrasounds. If they remain stable over time, a follow up is not required. 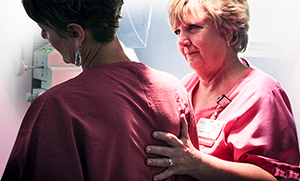 Find out more about how we diagnose breast cancer.